In a film career that spanned 24 years, Steve McQueen earned a reputation as one of the coolest actors to ever grace the screen. He had style and a cool, badass factor that was on display in movies like Bullitt, The Great Escape and The Thomas Crown Affair, among others. What’s lost in the shuffle? As downright cool as McQueen was, he was just as strong an actor. Nowhere was that more on display than 1966’s The Sand Pebbles. It’s 1926 in China, and sailor Jake Holman (McQueen) is arriving at his newest ship, the San Pablo, a US gunboat from the Spanish-American War. Holman has a bit of a track record, transferring from 7 ships in 9 years in the navy. A more than capable sailor, Holman has little use for military tradition, the rigidity of military life, and the thought that he should be ready to die for a cause he doesn’t believe in. Instead, he wants to be left alone in his engine room, taking care of the ship’s engine like few can. Holman wants to mind his own business and not be bothered, but as China tears itself apart, the San Pablo finds itself fighting for its life. From director Robert Wise, ‘Sand’ is a true epic in an era and decade that was full of big, gigantic, roadshow epics. Based off a bestselling novel from author Richard McKenna, it’s a gem. It clocks in at 182 minutes and streamlines the novel (which is 520-plus pages) to the essential character, story and history. It was filmed on-location in Taiwan and Hong Kong and looks and feels authentic. You feel like you’re there in 1920s China, a powderkeg just waiting to blow up. Composer Jerry Goldsmith‘s score earned an Oscar nomination as well, mixing the booming, epic touches with quieter, more emotional moments and then some Chinese influences too. Listen HERE for an extended sampling of the score. In his only Oscar-nominated role, McQueen absolutely brings it, showing off his acting chops in every scene. What’s most impressive is that he doesn’t ham it up, get too theatrical, or try to steal his scenes. He just does it, delivering his most human performance as Jake Holman, the US sailor/engineer who only wants to do his job. Talk about a tragic character, Holman gets one thing thrown at him after another. All he wants is to find his place in the world, but all the while, he’s pulled in 100 different directions. It’s an incredibly emotional part from the first time we meet Jake through all his trials and tribulations. Underplayed and perfect, nowhere is that more evident than Jake introducing himself to the San Pablo’s engine, stating “Hello, engine…I’m Jake Holman.” Criminally perfect, McQueen’s soft smile filling up the screen. Here is a man at his happiest. 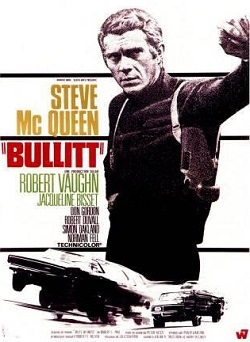 McQueen leads an impressive ensemble, but his scenes with 2 characters especially carry the movie. The first is the love interest with Candice Bergen‘s Shirley, a young, idealistic and naive missionary who sees all the good in tortured Jake. Their scenes together are quiet and moving, two disparate souls brought together in unlikely situations. The other key relationship is between Holman and Po-Han (Mako, an Oscar-nominated part), a young Chinese man who Holman takes under his wing, teaching him all about the science of the engine. The scenes of the experienced engineer teaching Po-Han are the heart of the movie, bringing Jake and Po-Han to life, a brotherly relationship, a father-son dynamic, a teacher and student, but it all works. So much more cast to mention! Reuniting after 1963’s The Great Escape, Richard Attenborough has an excellent chemistry with McQueen, playing veteran sailor Frenchy Burgoyne who clicks immediately with Jake. Frenchy’s subplot with a young Chinese girl, Maily (Emmanuelle Arsan) is especially heartbreaking. Richard Crenna delivers an incredibly underrated performance as Capt. Collins, the San Pablo’s much-maligned commander. Stiff, rigid, a patriot, intelligent but constantly worrying, Collins must find a way to get the San Pablo to achieve its mission, keeping countless plates spinning at all times. The crew includes Charles Robinson, Simon Oakland, Ford Rainey, Joe Turkel, Gavin MacLeod and Barney Phillips. Also look for Larry Gates as a devout missionary who won’t let anything stop him from achieving his mission. While the story and historical setting are essential to the movie’s success, the true essential is the characters and how the history impacts them. Go along for the ride, regardless of your knowledge of Chinese history (I know pretty much nothing). There isn’t much action until the final 30 minutes, the San Pablo battling its way through a well-guarded boom defended by Chinese nationalist troops. The finale itself is far more small-scale, a moonlit plaza serving as the backdrop between several San Pablo sailors and some well-hidden Chinese troops. And that ending…my goodness, that ending. As tough as it is, McKenna’s novel is actually much more harsh! The final line is a doozy, one that will no doubt stick with you long after viewing. McQueen at his absolute finest — up there with Papillon as his strongest performance — in this epic historical story with a great cast, well-developed story and memorable musical score. A must-see! If westerns are my favorite genre (they are), then spaghetti westerns would have to be my favorite sub-genre. Director Sergio Leone often gets credit for starting the spaghetti western craze, and he did…but his movies weren’t the first movies in the genre. Leone just put them on a worldwide level. The first spaghetti western (of sorts)? That’d be 1962’s The Savage Guns. It’s 1870 in Sonora, Mexico along the U.S./Mexico border. A land baron, Ortega (Jose Nieto), is terrorizing the area and all its smaller ranchers, including an American, Mike Summers (Don Taylor). Ortega sends his right-hand man, Danny (Alex Nicol), and his gang to systematically rob the ranchers of all their money – calling it protection money – and then shooting them if they don’t comply. There seems to be no solution, until an infamous gunslinger, Steve Fallon (Richard Basehart), drifts into town. Will Fallon stand with the smaller ranchers or will he move along to the next town? Well, a little mix-up here. The recent airing on Turner Classic Movies listed this western from 1973, not 1962. Whoops! ‘Savage’ was backed by British and Spanish producers, directed by Michael Carreras, and was the first western to be shot on-location in Almeria, Spain, specifically the same spot as the Caulder ranch in 1971’s Hannie Caulder. All the familiar touches that would become synonymous with the spaghetti western genre are there, from the locations to the big, booming musical — listen here —–> — score (composer Anton Garcia Abril) to the cynicism and violence evident throughout the story. It’s rough at times, a little disjointed and slightly odd, but its influence on countless westerns to come over the next 10-plus years is evident with each passing scene. One of the biggest influences the spaghetti western had was reviving the careers of American actors who had lost their star power, or catapulting young actors into stardom and the spotlight. ‘Savage’ leans more toward the reviving department. Never a huge star but a reliable character actor, Basehart is a little miscast as Fallon, the deadly gunfighter with quite a reputation. He looks to be having some fun but doesn’t bring a ton of energy to the part. In his last starring role before turning to the director’s chair, Taylor is solid as Summers, an ex-Confederate officer who has vowed to never use a gun again. Nicols does what he does best, hamming it up as the sneering Danny Pose (quite an intimidating name, huh?). Here’s the weird thing I’m trying to wrap my head around. This isn’t an especially good movie. In some parts, it’s downright dumb, even bad, but I was entertained. Partially, it’s the casting. No big names, just recognizable faces. It’s hard to describe though. ‘Savage’ plays out like a blueprint, a rough draft for what’s to come, especially its depiction of on-screen violence, and one particularly brutal wound for a main character. The spaghetti westerns especially took that to heart, wounding, crippling, maiming and torturing countless anti-heroes to come! While American stars often filled out the lead roles, Spanish, Italian and actors from all over Europe played the supporting parts. Nieto is the villain, Ortega, who’s generally pretty weak and isn’t given much background. Paquita Rico plays Franchea, Sommers’ wife (not given much to do other than look worried). The lovely Maria Granada (listed incorrectly as Manolita Barroso on IMDB) plays Juana, the love interest for Fallon. The age difference between Barroso and Basehart sure makes those love scenes look…odd? Uncomfortable? Forced? Yeah, all of that. Spaghetti regular Fernando Rey is Don Hernan, an exiled rancher of sorts. Some other familiar faces pop up in supporting parts as bandits, farmers and soldiers. All my criticisms aside, I genuinely liked this first spaghetti western, in spite of its flaws. The silent anti-hero, the over-the-top villain, the beautiful locations, the whistle-worthy musical scores, the mustachioed bandits, the brutal violence, it’s all there. It’s fun, and sometimes that’s all you need. Western fans should definitely get a kick out of this one. Keep an eye out for a re-airing on TCM, the print was gorgeous even if the audio was sketchy at times. By 1955, Henry Fonda had been away from major film roles for going on 8 years. After serving in the U.S. Navy during World War II, Fonda worked in film for several years before returning to the stage, specifically in a role he would play for 8 years. Naturally, when the film rights were purchased, Fonda wasn’t originally considered. Makes sense, right? Thankfully, the powers that be made the right decision, ultimately casting Fonda in the titular role in 1955’s Mister Roberts. It’s spring 1945 and Allied forces are pushing Japanese forces back across the Pacific with victory seemingly in reach. Thousands of miles back across the Pacific on a securely head island, Lt. Doug Roberts (Fonda) is the cargo officer on a cargo ship that helps supplies the nearby island and passing ships heading toward the fighting. After 2-plus years on the ship, Roberts feels he’s not doing enough to help the war effort, and he would like nothing more than to serve on a destroyer in the fighting. The ship’s commander, Capt. Morton (James Cagney), knows his value to the ship and its efforts though, so he won’t approve Roberts’ transfer. In the meantime, Roberts continues to keep working hard, all the while working as a buffer, a go-between between the much-maligned crew and the crazy captain. A huge hit for many years on Broadway with Fonda in the starring role, ‘Roberts’ made the inevitable jump to the big screen with classic results. Impressive considering the production was less than smooth, director John Ford clashing with Fonda and Cagney to epic proportions (Fonda supposedly punched him square in the face) to the point Ford eventually left the production. Mervyn Leroy took over with Broadway director Joshua Logan also helping with reshoots. It’s debatable which director shot what footage — some Ford footage with some broad humor seems to stand out — and at times, the first 45 minutes are a little slow, but the end result is a highly memorable flick that deserves its classic status (or at least its mostly classic status). You take for granted sometimes how good an actor can be. Henry Fonda was never a flashy actor, always stealing scenes in subtle, underdone fashion. Then, you finish the movie and realize how good he was. His part as Lt. Roberts belongs with his best roles, 12 Angry Men, The Grapes of Wrath, Once Upon a Time in the West, and who knows? It might be his best. Fonda specialized in a long distinguished career at playing the everyman, Joe Normal who’s thrust into an unpleasant situation. As Roberts, it’s dramatic, there is some comedy, and a genuine humanness that plays incredibly sympathetic on the screen. He wasn’t nominated for the Oscar, but he should have been. Fonda not surprisingly steals the movie, impressive considering the cast around him. Cagney hams it up in a big way (even for him), overdoing it as the narcissistic, egomaniacal Capt. Morton. You need a bad guy though to counter Fonda’s Roberts, and you get it with Cagney. William Powell is perfectly cast as Doc, the ship surgeon who’s good friends with Roberts. Their dialogue-heavy scenes together are a gem, just 2 guys talking, not 2 guys acting. Jack Lemmon won an Oscar for his supporting role as Ensign Pulver, the young officer with some issues who clearly looks up to Roberts and is trying to impress him while dealing with his own shy, nervous, lazy demons. Because that quartet clearly isn’t enough, the crew of the USS Reluctant (the cargo ship) features Ward Bond as the ship chief, Dowdy, with Ken Curtis, Philip Carey, Nick Adams, Perry Lopez, Robert Roark, Harry Carey Jr. and Patrick Wayne rounding out the cast. Also look for small parts for Martin Milner, Gregory Walcott and Ford favorite Jack Pennick. The 1950’s were an especially popular time for navy stories, especially World War II navy stories set in the Pacific. ‘Roberts’ would even inspire a sequel, 1964’s Ensign Pulver (not good). This is one of the prettiest, sunniest, most beautifully shot movies of the decade. I can’t recall a single scene that isn’t sun-drenched with cool blue waters in the background. The US Navy aided during filming, and it shows with an authentic military look and feel to the proceedings. Composer Franz Waxman turns in a solid score too, appropriately balancing the comedic and dramatic moments. Give it a listen HERE. In my latest viewing, I struggled early on in a 121-minute movie. It’s slow — really slow — setting things up. Thankfully, when things up, they do in lightning-quick fashion. After a slow first 45 minutes, ‘Roberts’ hits its groove. It builds and builds, right up into a highly memorable final stretch. This is a movie that’s ready to punch you right in the stomach with a tragic final 15 minutes. It helps save the early portions and ends the movie on a great final scene. Excellent flick — flaws aside — with Fonda in one of his best performances in a long list of best performances.